Investigations of the neural basis of theory of mind - the ability to think about other people's thoughts - only recently became feasible; now, the number of such investigations and the sophistication of the results are accelerating dramatically. The articles in this special issue use a wide range of techniques (including fMRI, EEG, TMS, and psychophisiology) and subject populations (including children, twins, and patients with developmental or acquired neural damage) to address fundamental questions about the cognitive and neural structure of theory of mind. Topics include: (1) the relationship between theory of mind and other, perhaps "precursor", social cognitive processes, such as empathy and the perception of biological motion; (2) the relationship between theory of mind and domain-general cognitive functions, such as executive function and language; and (3) how theory of mind is deployed in real social contexts, such as social exchange. Emma Chapman, Simon Baron-Cohen, Bonnie Auyeung, Rebecca Knickmeyer, Kevin Taylor, and Gerald Hackett, Fetal Testosterone and Empathy: Evidence From the Empathy Quotient (EQ) and the "Reading the Mind in the Eyes" Test. Simone G. Shamay-Tsoory, Yasmin Tibi-Elhanany, and Judith Aharon-Peretz, The Ventromedial Prefrontal Cortex is Involved in Understanding Affective but not Cognitive Theory of Mind Stories. Michael Siegal and Rosemary Varley, Aphasia, Language and Theory of Mind. Jonas T. Kaplan and Marco Iacoboni, Getting a Grip on Other Minds: Mirror Neurons, Intention Understanding and Cognitive Empathy. Andreas Mojzisch, Leonhard Schilbach, Jens R. Helmert, Sebastian Pannasch, Boris M. Velichkovsky, and Kai Vogeley, The Effects of Self-involvement on Attention, Arousal and Facial Expression During Social Interaction With Virtual Others: A Psychophysiological Study. Elsa Ermer, Scott A. Guerin, Leda Cosmides, John Tooby, and Michael B. Miller, Theory of Mind Broad and Narrow: Reasoning About Social Exchange Engages TOM Areas, Precautionary Reasoning Does Not. Atsushi Senju, Mark H. Johnson, and Gergely Csibra, The Development and Neural Basis of Referential Gaze Perception. Christopher M. Kipps and John. R. Hodges, Theory of Mind in Frontotemporal Dementia. Josef Perner, Markus Aichhorn, Martin Kronbichler, Wolfgang Staffen, and Gunther Ladurner, Thinking of Mental and Other Representations: The Roles of Left and Right Temporo-parietal Junction. Francesca Mazzola, Anna Seigal, Andrew MacAskill, Ben Corden, Kate Lawrence, and David H. Skuse, Eye Tracking and Fear Recognition Deficits in Turner Syndrome. Alan M. Leslie, Ron Mallon, and Jennifer A. DiCorcia, Transgressors, Victims and Cry Babies: Is Basic Moral Judgment Spared in Autism? Rebecca Saxe, Laura E. Schulz, and Yuhong V. Jiang, Reading Minds Versus Following Rules: Dissociating Theory of Mind and Executive Control in the Brain. Mark A. Sabbagh and Jessica Flynn, Mid-frontal EEG Alpha Asymmetries Predict Individual Differences in One Aspect of Theory-of-mind: Mental State Decoding. 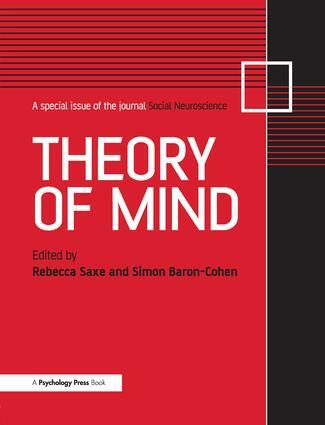 Valerie E. Stone and Philip Gerrans, What's Domain-specific About Theory of Mind? Ilaria Minio-Paluello, Alessio Avenanti, and Salvatore M. Aglioti, Left Hemisphere Dominance in Reading the Sensory Qualities of Others' Pain. Ian A. Apperly, Dana Samson, Naomi Carroll, Shazia Hussain, and Glyn Humphreys, Intact 1st and 2nd Order False Belief Reasoning in a Patient with Severely Impaired Grammar. Chris Ashwin, E. Chapman, L. Colle, and Simon Baron-Cohen, Impaired Recognition of Negative Basic Emotions in Autism: A Test of the Amygdala Theory. Bhismadev Chakrabarti, Edward Bullmore, and Simon Baron-Cohen, Empathizing with Basic Emotions: Common and Discrete Neural Substrates. Rebecca Elliott, Birgit Völlm, Andrew Drury, Shane McKie, Paul Richardson, and J. F. William Deakin, Cooperation with Another Player in a Financially Rewarded Guessing Game Activates Regions Implicated in Theory of Mind. Elizabeth J. Carter and Kevin A. Pelphrey, School-aged Children Exhibit Domain-specific Responses to Biological Motion. Angelica Ronald, Essi Viding, Francesca Happé, and Robert Plomin, Individual Differences in Theory of Mind Ability in Middle Childhood and Links with Verbal Ability and Autistic Traits: A Twin Study.